‘Every week we gather here to listen to religious discussion. It is imperative that we have a clear objective regarding these gatherings. These are not lectures of formal religious education. These are training sessions (tarbiyeti) for the spiritual aspirants (salikeen). 1. 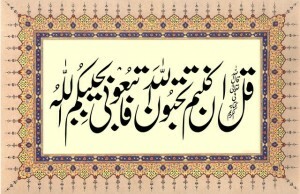 Create and nurture love of Allah and His beloved Prophet (blessings and peace of Allah be upon him) in our hearts. 2. Develop the habit of turning (ruju’) to Allah in all circumstances via supplication (dua). 3. Emulating the Sunna method of doing things in every aspect of life. 4. Becoming cognizant of here-after and accountability for one’s deeds. This entry was posted in A. Reality of Tasawwuf, B. Praise worthy morals, D. Acts of Worship, E. States, F. Zikir & fikr, J. Rights , N. Advice, Q. Akabir, S. Sunna, T. Tarbiyet on July 7, 2010 by 'abd.